Today we took a ride into Lost Johnny. We found overall great riding conditions beyond the end of the road (5500 ft). Valley bottom up to 5000 ft. 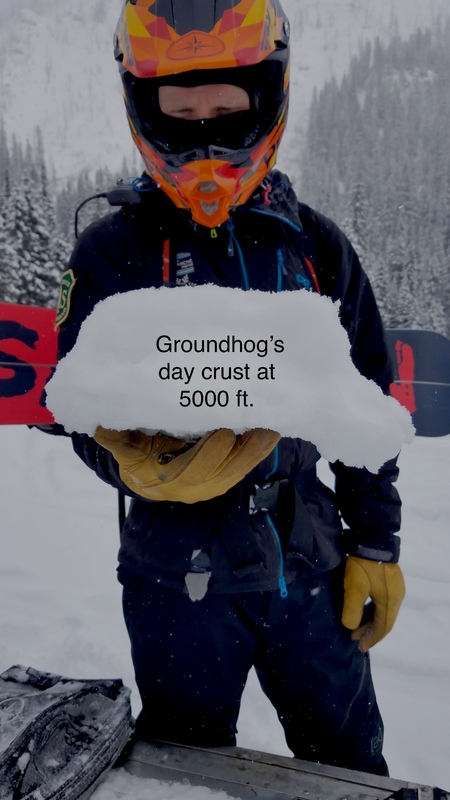 The crust from Groundhog's Day (2/2) is 3-4 inches thick and supportable to the weight of a snowmobile. 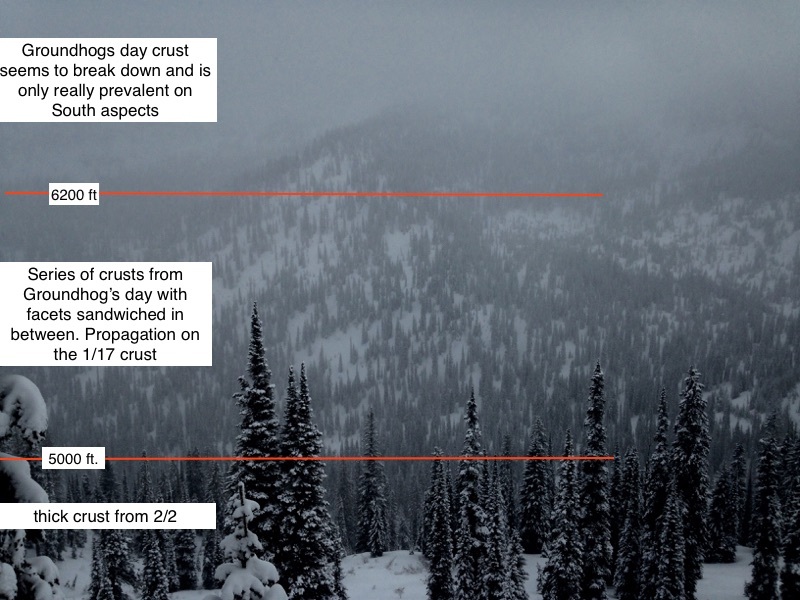 Near the 5000 ft mark there is 5-7 inches of new light snow on top of the crust. 5000 ft to 6200 ft. 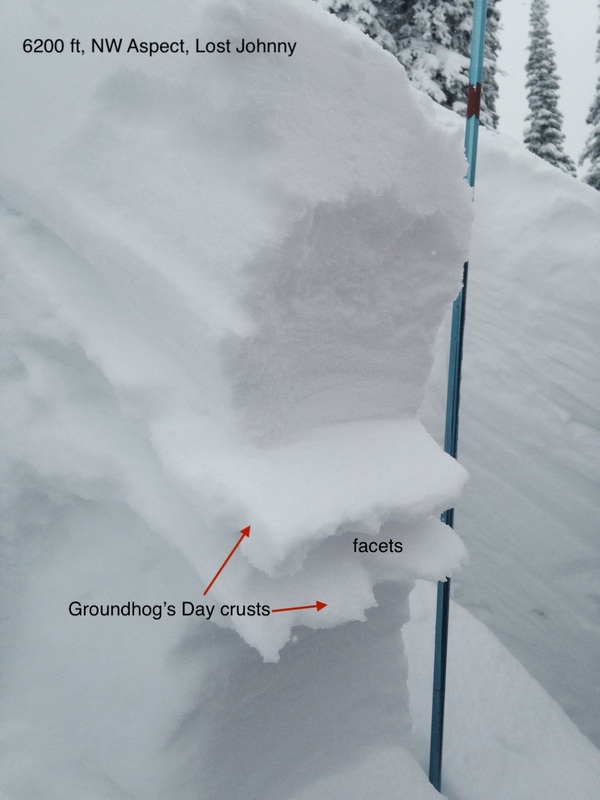 The Groundhogs Day crust in the mid elevations seems to split with a thicker, more supportable crust below and thin, breakable crust above. Sandwiched in the middle is a 1 inch layer of facets. No results, however, in our pits. 6-8 inches of Fist hard new snow. 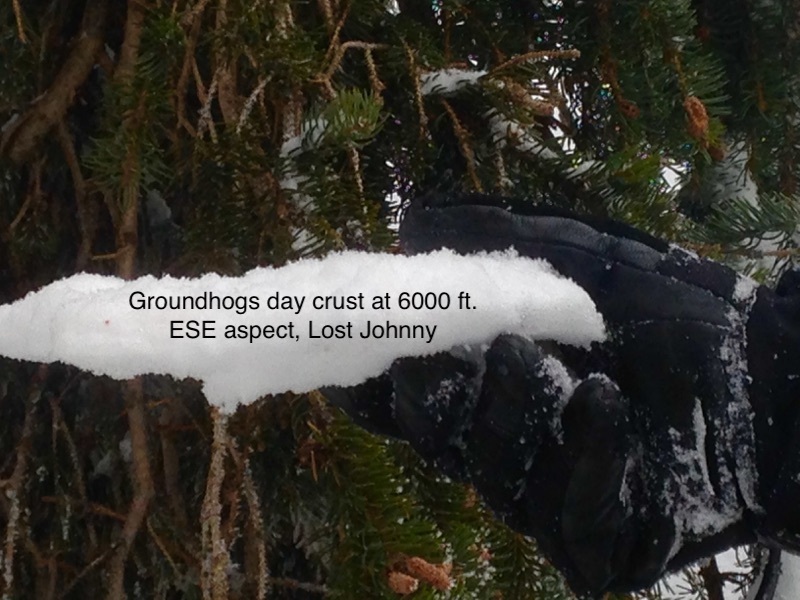 The Groundhog crust seems to mostly disappear with the exception being South facing aspects. On these aspects it is still thin, but provided some instabilites with the surface snow. 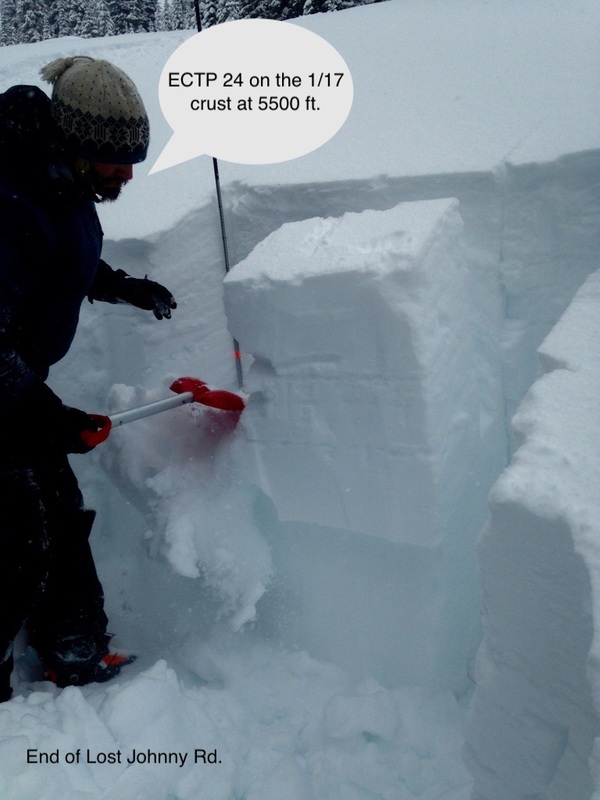 8+ inches of Fist hard new snow. 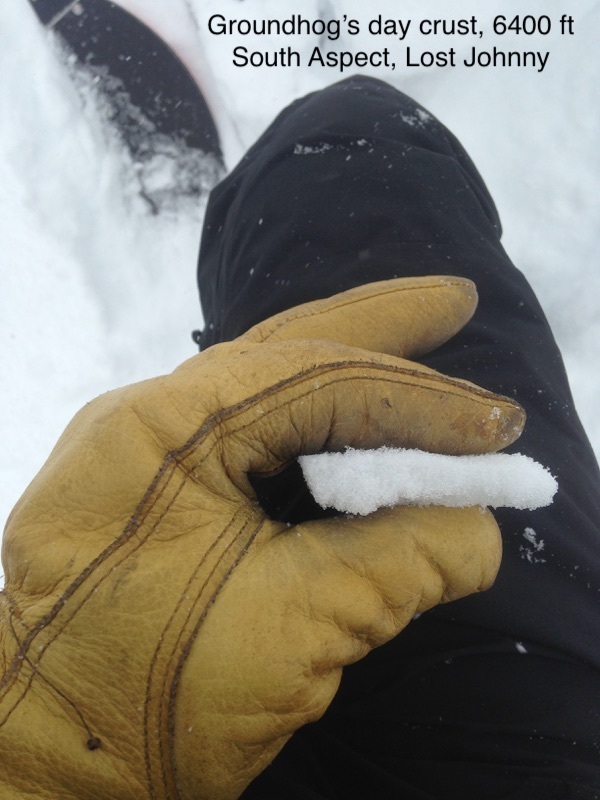 Sluffing snow on steeper terrain was evident while skiing down. There was little evidence of wind. We skiied steep, gladed terrain with the only signs of instabilites being sluff running in the steeper pitches. Cold! It seemed to warm slightly throughout the day. Snow was falling lightly all day, with accumulations less than 1 inch by the end or our ride. There was generally no wind, with only the ridgetops near 7000 ft seeing light breezes.